I kept my Arizona win streak going by winning the Phoenix Half Marathon this weekend (1:07:00). Last year I won the marathon here. And on Thanksgiving I won the Mesa Turkey Trot 10K. Maybe I just need to always race in Arizona? The weather was decent considering we were expecting much worse. There was some rain in the early miles and a bit of a noticeable headwind, but the major storm forecast was greatly exaggerated. The heavy rain actually came down later on Saturday evening... good timing! In some ways the overcast skies were nice (cooler!). My plan was to run for the win and not worry too much about the time once we knew the weather forecast was looking a little crazy. Jesse Armijo and I ran the first mile together, then he took the lead and put a small gap on me. For the first 7 miles, I was between 15-25 meters off his lead. It didn't seem like there was anyone putting pressure on from behind us. I kept thinking to myself "make a move at 10" like I did in the PF Chang's 1/2 last year. I started reeling him during the 8th mile and sensed an opportunity to put in a surge and take the lead just before the 9 mile mark. I ran the 10th mile pretty hard to open up a gap, then I had a big enough lead to back off a little the rest of the way. I ended up winning by a comfortable 52 seconds. Andrea and my parents were out on the course in 5-6 different spots providing encouragement. They are awesome! The time doesn't really reflect a big improvement since January, but I can tell I'm getting in shape now. The major positive "take home" was that around the halfway point of the race, I knew I wasn't settling for second place. I was thinking about the best strategy for how to win the race, and knew I was going to win the race. The Phoenix Marathon is somewhat new to the scene, but it has already established itself as one of the best events in the Southwest. The marathon is a great course for Boston Qualifying, and they offer generous prize money to the elite runners in the marathon as well as a $500 bonus for sub 2:20/2:45. The half-marathon only has a few turns and has a slight net drop from start to finish, making it the fastest Olympic Trials qualifying eligible courses out there that I am aware of. Both courses are certified and sanctioned, so you know they are accurate (I've seen people make comments online that the course measured long - they just need to realize that Garmins aren't that accurate). I've never felt the need to comment about a race t-shirt before, but I feel like I have to say something in this report. The shirt given out by the PHX Marathon this year is definitely the best I've ever gotten at a race. It's fitted and made of some sort of stretchy material that is really cool. That sort of attention to detail is what will help this race continue to grow. I know from speaking to the race directors on many occasions that they are always striving to improve and make the race experience as great as they can. I'll circle this one on my race calendar for 2015. If I have the OTQ by then, I'd like to run this marathon again. 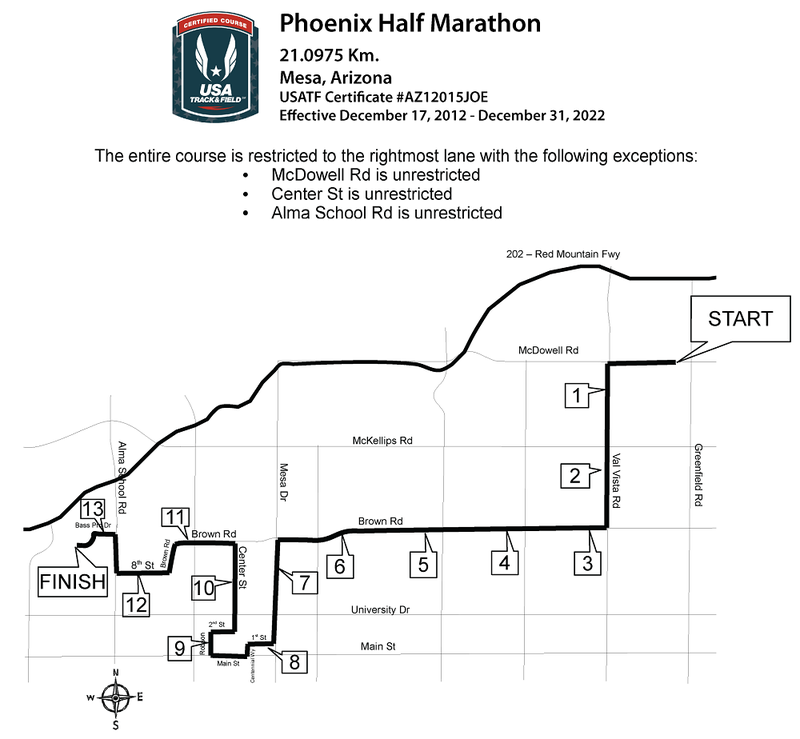 If I don't, then it will be a great spot to go for the OT standard in the half-marathon. Especially since after this year's rainstorm, it is almost guaranteed that this race will have perfect weather for the next 20 years! I'd highly recommend this one as a great spring race destination. And a pocket! The shirt also has a small zippered pocket on the right hand side, why did you not mention that! Good point! Now they will know... thanks!